In exile the members of the royal family went their separate ways. Queen Maria Pia returned to Italy, her native country, where she died nine months later. Only minutes before she died she asked her servants to turn her body in the direction of Portugal. The others went to England, where the Duke of Orléans (Queen Amelia’s brother) received them at his house in Woodnorton. Many royalists changed to the republican side just one day after the revolution. There was, however, still some monarchist resistance to the new republican regime, but not enough to convince King Manuel that he should fight for restoration of the monarchy. During the following year, 1912, Manuel travelled a lot. While he was on his way to Switzerland, he stopped in Sigmaringen to visit his great-aunt Antónia de Bragança. Here he met her niece, Princess Augusta Victoria of Hohenzollern-Sigmaringen. The two liked each other, and in 1913 they got engaged. They married on 4 September 1913. For the first time since the regicide, Queen Amelia discarded her mourning clothes and chose a bright dress to attend the wedding of her son and 'Mimi', as she called her daughter-in-law. The beginning of the First World War filled King Manuel with mixed feelings. On the one hand, he supported England since England and Portugal were historical allies. On other hand, his wife was German and both his brothers-in-law were in German military service. Queen Amelia wisely advised her son only to get involved in the humanitarian part of the conflict, which he did. Soon after the war started, Queen Amelia visited France, her native country, to see the atrocities for herself. The visit made a huge impression on her, and she started helping out in several hospitals in Britain. Another sad event for Queen Amelia occurred in 1917. Her brother-in-law, Prince Afonso, decided to marry Nevada Hayes Chapman, a lady who had already been divorced three times. As this was rather scandalous at the time, Amelia was forced to break off all contacts with him. In April 1919, the Countess of Paris, Amelia's mother, died in Villamanrique, Spain. In February of the following year, Prince Afonso (Amelia's brother-in-law) died in Posillipo, Italy. Because of his controversial marriage, none of his Portuguese relations were present when he died. After these two deaths, Amelia decided to leave England for good. The doctors had advised her not her to spend another winter season in England, and she was also missing France, where she had good memories of her relaxed youth. Her wish was to live close to Palace of Versailles. She chose a mansion in Chesnoy, known as Château de Bellevue, and spent the next 30 years of her life there. In Chesnay, the Queen mixed with the community, helping the Red Cross and other charities. King Manuel kept his mother informed about his decisions and politics, although the movement to restore the monarchy in Portugal was dying out. The last time Amelia saw her son Manuel alive was in 1932 at the Wimbledon tennis championships. Her instinct told her that something was wrong with him, and indeed he was sick. He called his doctor, who diagnosed tracheal edema and advised him to take some rest. This was not enough, however, and he died later that year, of unknown causes. Queen Amelia had a weird premonition about this tragedy; when the letter with the news arrived at her house in Chesnay, she said “Je sais… mon fils, est mort” – I know my son is dead - even before she opened the envelope. 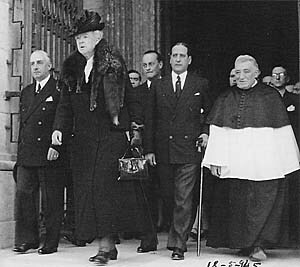 Queen Amelia organized all the funeral ceremonies in the Catholic Cathedral of Westminster, just as she had done in Lisbon when her husband and eldest son died. 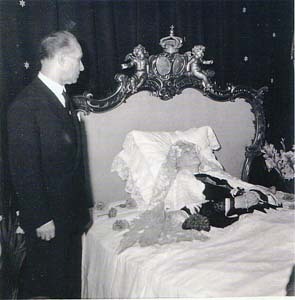 The Marquis of Lavradio, who was the personal secretary of King Manuel, wrote in his memoirs: “when the coffin was passing through the cathedral’s door, Her Majesty D. Amelia took her hands to her lips and sent a last kiss to her son, with a gesture so full of tenderness that I was not able to forget.” Prime Minister Salazar decided to bring the king’s body back to Portugal and give him a state funeral. Queen Amelia and Queen Augusta Victoria were, however, not allowed to be present. 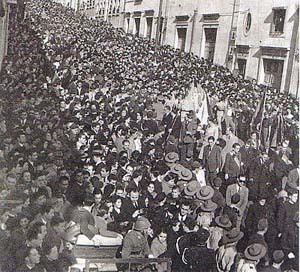 King Manuel was laid to rest in the church of São Vicente de Fora, the pantheon of the Bragança family. In the following year it became clear that Manuel’s last will bequeathed to Portugal a huge quantity of his patrimony. These goods were later used to create the House of Bragança Foundation. Queen Augusta Victoria returned to Germany, and she would later marry Count Karl Robert Douglas. When the war was over, Salazar invited Amelia to visit Portugal. She arrived on 19 May 1945, a few minutes before midnight; it was the same date on which she had first arrived in Portugal as the fiancée of Don Carlos. On the first morning of her stay, she went to São Vicente de Fora to visit the tombs of her husband, sons, and infant daughter. After that visit she was received by the higher ecclesiastic authorities including the Patriarch Cardinal of Lisbon Gonçalves Cerejeira, the highest religious authority in Portugal. When the Queen left the church she heard applause from the people on the street. The following days she visited some old friends in Cascais, and went to the Palace of Pena, in Sintra, where she greeted her old employees. Amelia, making a pilgrimage through the rooms of the palace, remembered that everything she loved was not there any more. She ended the visit crying at the palace’s chapel. On 21 May she met Salazar in person for the first time. They spent all day together, and after this visit they would exchange many letters. He had such influence over her that he convinced her to change her will in order to benefit the other, rival branch of the family, the Miguelistas side, who were in a financially precarious situation. The Queen also paid a visit to the Marian Sanctuary of Fatima. The apparitions of the Virgin in Portugal happened after her exile, but Queen Amelia felt a great devotion for Our Lady of Fatima. When she left for France, the railway station was filled with people, many of whom wanted to say their farewells. Inside the train, the Queen waved goodbye and cheered “Viva Portugal!” without any grudge. In her honour Salazar decided to rename the old National Association against Tuberculosis (founded by the Queen in 1899) to Preventório Rainha D. Amélia. The last three years of Amelia’s life were increasingly dogged by pain and ill health. Her heart problems were getting worse, and she also suffered periods of depression and confusion. The first symptoms of her mental illness became evident when she confused Bellevue with Lisbon. In Portugal several newspapers mentioned her fragile state, but some of her enemies continued to attack the old lady. In 1950 the newspaper Republica criticized all the attention given by the public to the Queen and tried to diminish people's worries about her health. The queen's bouts of depression became more and more frequent, and worries about her future funeral became an obsession to her. Her faith was fundamental to her strength in the face of adversity. She used to attend the mass at Church of Saint Anthony every day. This church still has the image of the Virgin of Fatima that she had offered. In 1951, Amelia's sister Princess Isabelle died, after which her periods of dementia became more frequent. During her mental torments and living alone only with her servants and secretary, she asked everyone who could hear her: “why was I exiled? Why did they kill my sons?” Amelia didn’t say “son” but “sons,” which led some to think that she knew more about the suspicious death of her younger son than was officially said. The Queen's health continued to deteriorate and by the end of September 1951, she was kept alive only with the help of a huge quantity of medication. On 5 October her last words were to her faithful secretary, Julio da Costa Pinto. She recognized him, thanked him, and smiled while he was crying and kissed her hands. The Queen died 20 days later, only a few seconds after someone had given her some water. Smiling, and without a murmur or complaint, the Queen was finally at rest. She was 87 years old. Grande Reportagem magazine, nº61, article: "No tempo dos reis"